The faces of these bug boxes swing open and bugs can be deposited into screened compartment so children can enjoy watching their catch. Add wheels and a pull rope for extra fun. 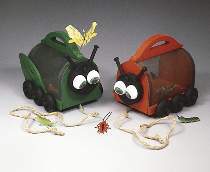 Includes FULL SIZE patterns for both the lady bug and grasshopper bug boxes pictured. Measures 8"L. Order wheels, axel pegs and plastic eyes separately below.